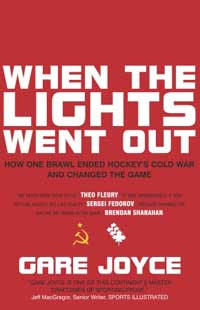 I finally cracked the spine on Gare Joyce's much acclaimed title When the Lights Went Out: How One Brawl Ended Hockey's Cold War and Changed the Game. 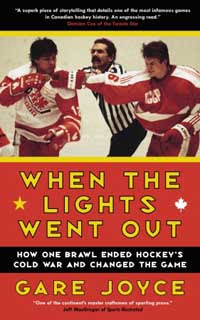 The book covers the infamous Canadian-Soviet brawl at the 1987 World Junior Hockey Championships. "The Punch-Up In Piestany" featured the likes of Brendan Shanahan, Pierre Turgeon and Theoren Fleury vs. Alexander Mogilny, Sergei Fedorov and Vladimir Konstantinov. The incident is one of the most infamous in hockey history, yet, as Joyce leads us to discover, one of the most significant as well. Joyce is one of Canada's top sports writers, and almost certainly the tops when it comes to the junior hockey scene. His writing really does define him as "one of this continent's master craftsmen of sporting prose" who is capable of authoring "a superb piece of storytelling," as the book's cover boasts. They say don't judge a book by its cover, and that would be good advice to heed with "Lights." The cover is unattractive and simplistic, although the Autumn 2007 paperback release (second image) is somewhat improved. But once you crack open the prologue you quickly realize that this is a book that you must read. It isn't a book about a hockey fight, nor a hockey game nor a hockey tournament. This is a book about hockey history, and how the events of this moment in time would change hockey forever. After reeling me in hook, line and sinker with the prologue, I was ready jump into the main event and the interpretation of its' aftermath. But of course Joyce has to set up the background and the main characters before proceeding. For someone who at least pretends to know my international hockey history, I found this step to cause me to lose my steam. Though obviously necessary, I found it a bit long. Once I worked my way through the background and through the tournament, I finally found the story's centerpiece. Instead of recreating the scene as it was, Joyce takes a unique approach and tells the story of him watching the game on DVD some 20 years after the fact. Much of the time I felt like I was reading his research notes. While I found the style cumbersome at first, I got used to it and realized it really allowed Joyce to properly display his research. All of his interviews are in past tense, thus allowing the story's characters to comment at the perfect time. I find the book's true strength is Joyce's unique look into the lives of many of the players. Joyce doesn't focus strictly on the Canadians, but gives equal time to the Russians, allowing for a truly in depth and balanced look at not only this game and this tournament, but the long term aftermath. The rare look into the Soviet players' lives in the days when the Iron Curtain was crumbling but still standing firm was a treat for me. Reading about Alexander Mogilny, Sergei Fedorov and Vladimir Konstantinov's unique backgrounds was truly unique. With many Canadian and Russian protagonists he follows up on each career and life, warts and all, allowing for an incredibly well pieced together portrait of some notable hockey players. And it's not just the superstars who Joyce profiles. I really enjoyed learning about the lesser-knowns. Players like Stephane Roy, Patrick Roy's brother. And Steve Nemeth, a leader who chose not to fight, and paid an unnecessary price to do so. And Evgeni Davydov, the ridiculously talented winger who never could add up the sum of all his parts. I opened "Lights" fully aware of the critical acclaim it got. The book did not disappoint. I'd strongly recommend it to any hockey fan.